Paris, Fraance. Language: French. Publisher: Chacornac Freres. Editor: Rene Guenon; Rene Allar; Andre Preau; Fritjof Schuon; "Jean Reyor" (Marcel Clavelle); Michel Valsan; A. Villain; Titus Burkhardt; Leo Schaya. From the beginning of the journal until his retirement in January 1961, Paul Chacornac was director. 41/193, January 1936-93/518, October-December 1992. 48 pp. (varies); 30 francs a year (40 outside France)-130 francs. The journal continued the volume numbering of Voile d'Isis. Publication was interrupted during World War II (June 1940-November 1945). The journal published the works of Rene Guenon and of his followers and, until its last years, was under the control of the traditionalists and had as its goal the explication of "la tradition perpetuelle et unanime" and discussion of whether there were "des possibilitites initiatiques dans les formes traditionnelles occidentales." In its traditionalist approach, as Paul Chacornac explained in the first issue, the journal continued the policy Voile d'Isis had already been following since 1929. After the Romanian Michel Valsan assumed control of the journal in 1948, the journal increasingly gave place to a traditionalist view of Islam. Contributions by Guenon, Andre Preau, Julius Evola, Ananda K. Coomaraswamy, Rene Allar, J.H. Probst-Biraben, Paul Vuillaud, Whitall Perry, Martin Lings, Marco Pallis, Titus Burkhardt, Luc Benoit, et al. BNF; Amsterdamse Universiteitsbibliotheek; Koninklijke Bibliotheek; Radboud Universiteit Nijmegen. Etudes Traditionnelles V70 N414 Jul-aug 1969. Etudes Traditionnelles V70 N415 Sep-oct 1969. 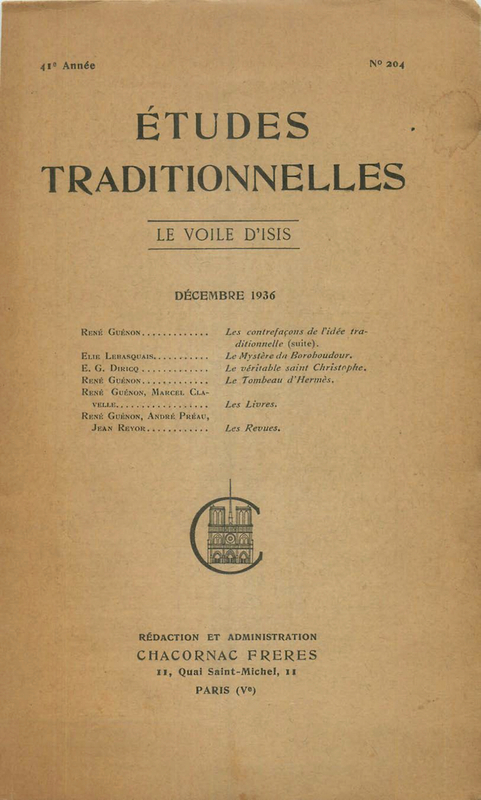 Etudes Traditionnelles Chronological Article Index 1935-1992.